Sometimes it’s hard to find a book you’ll like, which is why we’ve done the dirty work for you! 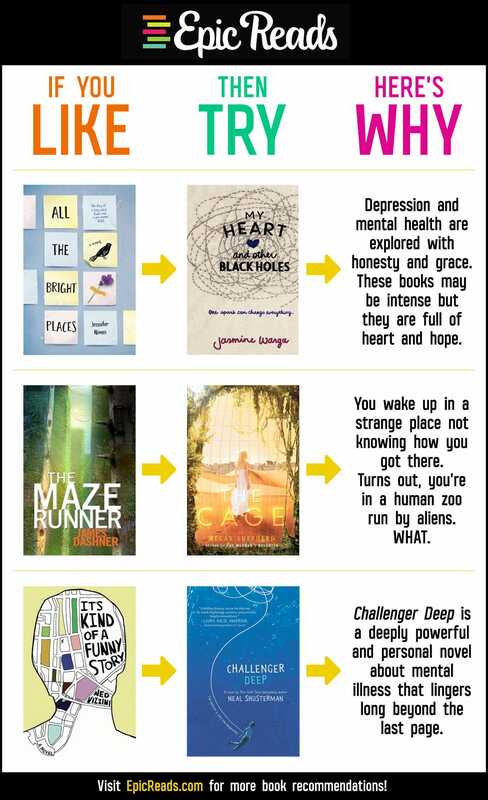 If you like All the Bright Places by Jennifer Niven, The Maze Runner by James Dashner or It’s Kind of a Funny Story by Ned Vizzini, we have book recommendations for you! Here’s why: All the Bright Places and My Heart come from very dark places, showcasing teenagers struggling with depression and thoughts of suicide but what makes these book different than other YA books dealing with similar mental illnesses is that the writing is raw and honest but ultimately very hopeful. Where All the Bright Places focuses more on the love story, My Heart and Other Black Holes shines a stronger light on how one can move through and past the pain of depression and into a hopeful recovery. Start reading My Heart and Other Black Holes here! Here’s why: You know that feeling at the beginning of The Maze Runner, when Thomas wakes up in the elevator and arrives in The Glade not knowing what the heck is going on and being very confused and terrified? That exact same feeling you get when reading The Maze Runner is what you’ll feel when you read The Cage by Megan Shepherd except this time it’s a girl waking up in a human zoo run by aliens! Start reading The Cage here! Here’s why: Similar to how It’s Kind of a Funny Story was a personal story for Ned Vizzini, Challenger Deep comes from a very personal place for author Neal Shusterman. Drawing on his son’s experiences with schizophrenia, Neal has created a truly remarkable and poignant novel. Plus, 12 pieces of Neal’s son Brendan’s haunting artwork are included throughout the novel! Start reading Challenger Deep here! What books would you like us to make Like, Try, Why’s for? Let us know in the comments below or submit your request for a Like, Try, Why via our Tumblr here.